One of my favorite attractions at the 1967 World’s Fair was a lattice of plastic cubes that contained samples of the elements, the basic building blocks of all chemical compounds. The Elements: A Visual Exploration is a brilliant app that brings the elements to life on the iPad, and is every bit as compelling. The home screen displays a periodic table filled with miniature movies. Tapping on an element expands the movie to fill the screen and shows some basic facts about its physical properties. If you have a live Internet connection, you can learn more about the element’s crystal structure and other characteristics through the Wolfram Alpha search engine, which runs in a window that overlays the main display. 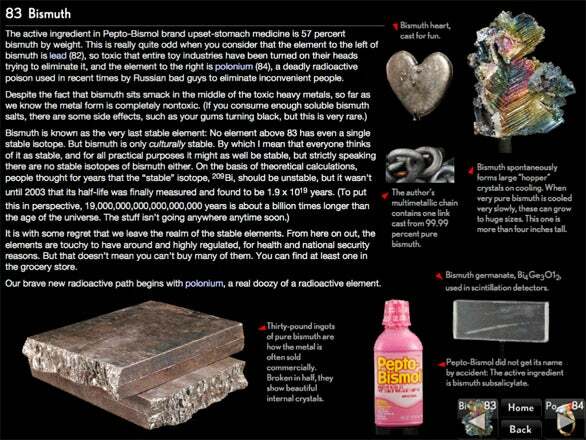 Mind Your Bismuth: Even science experts will learn something from The Elements’ whimsical and informative descriptions. Another button brings up a detailed description along with photos of the element in its various forms. You can spin the images by flicking them with your finger, or you can double tap to enlarge them. You can even display the pictures as stereo pairs that appear in 3-D when you view them through special glasses, which you can order online for about $5. Whether you’re a chemistry whiz or you can’t tell antimony from argon, The Elements is worth every penny.